Everything depends on perspective. Guido Lengwiler’s new book on the history of screenprinting (reviewed in this issue) carries the subtitle, “How an Art Evolved into an Industry.” Richard S. Field’s 1971–72 exhibition on the history of screenprints might well have been subtitled, “How an Industry Evolved into Art.” Since its inception, screenprint has been both a pragmatic instrument of commercial design and a folksy, artisanal craft. But as contemporary art continues to borrow and manipulate the artifacts of commerce (like screenprint), and commerce continues to find profit in positioning its products as arty (like screenprint), the tango of art and industry, medium and message, becomes ever more convoluted. Field’s exhibition, “Silkscreen: History of a Medium” at the Philadelphia Museum of Art, was a watershed, establishing a scrappy commercial technology as an important vehicle of contemporary art. The medium had been around for less than a century, used mainly as a way to repeat bright simple designs on felt flags, packing crates and posters. (The attempt to rebrand it as an expressive, gestural medium under the moniker “serigraphy” had enjoyed only moderate success.) Screenprint seemed a world away from the fluid gestures and diaphanous tones on which etching and lithography based their status as fine art. In 1971, that was the point. Moreover, screenprint’s photomechanical capabilities aided and abetted the appropriation and recapitulation of borrowed images, fundamentally changing what contemporary art thought it was about. “Style,” Field wrote, “became a matter of media paraphrase rather than the result of the artist’s hand.”3 It was a paradigm shift. Left: Patrick Caulfield, Crying to the walls: My God! My God! Will she relent? Center: Thus she would come, escaped, half-dead to my door. Right: She fled along the avenue. All from Some Poems of Jules Laforgue, Edition C (1973), book of twenty-two screenprinted illustrations for twelve poems in three varying editions, image 40.5 x 35.5 cm, sheet 61 x 56 cm. Edition of 100. Courtesy of the artist and Alan Cristea Gallery. The exhibition checklist reads like a directory of the critical artists of a critical decade: Thomas Bayrle, Caulfield, Christo, Richard Hamilton, Jasper Johns, Sol Lewitt, Roy Lichtenstein, Bruce Nauman, Robert Rauschenberg, Bridget Riley, Dieter Roth,4 Ed Ruscha, Frank Stella, Andy Warhol—the list goes on and on. Aided by a handful of talented printers (Kelpra Studios in London, Edition Domberger in Stuttgart, Ives-Stillman in New Haven and others), they changed the landscape of print and of painting. Today screenprint is accepted as one of the essential printmedia phyla, alongside relief, intaglio, lithography and now digital. Virtually every academic printmaking department offers it, as do the majority of fine art printers. But the medium gets short shrift in art historical surveys,5 perhaps because its history is that much shorter or because it is still perceived as a bit dumb. (Jasper Johns, who made some of the most virtuosic screenprints of the 20th century, observed, “silkscreen, basically, is very simple minded. It’s simply an opening through which ink can go and be deposited on paper. And the fact that the silk is there allows you to have very complex openings.”6 If intaglio, lithography and relief glow with the patina of age and pedigree, while digital gleams with the seductive promise of a new iPhone, screenprint is just kind of there. 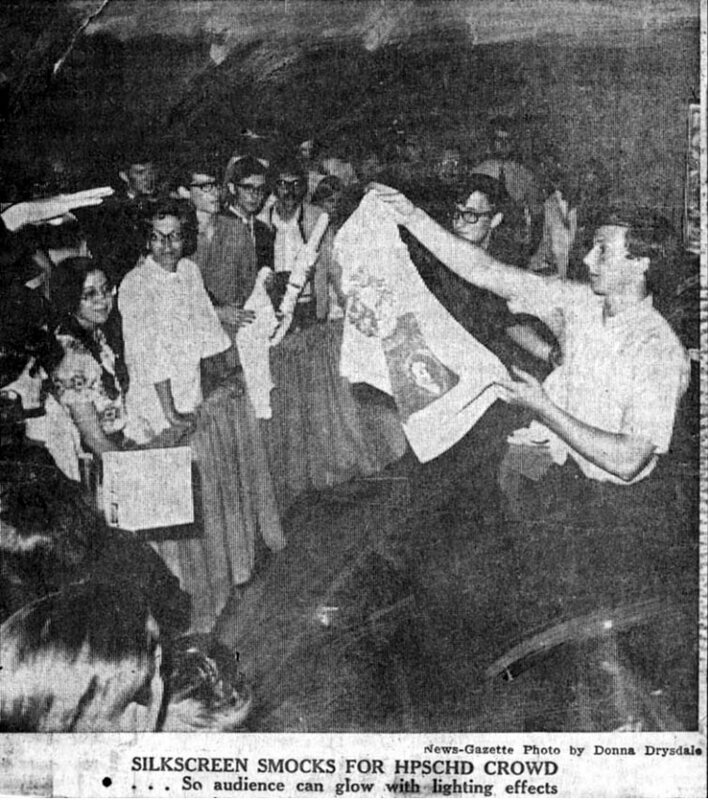 Newspaper photograph taken at 1969 premiere of HPSCHD showing screenprinting of smocks and other garments with the Beethoven/Cage design being distributed to the audience. Reproduced by permission of The News-Gazette, Inc. Permission does not imply endorsement. But “there” is everywhere. 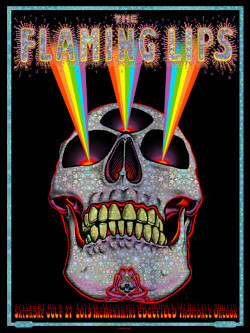 On paper and walls and metal and stone; on gig posters and monumental canvases. On skateboards and circuit boards and dashboards, not to mention all those T-shirts. Both Wall Street and Occupy Wall Street depend on it. Etching and lithography—even video and performance art—seem to have clear parameters and identifiable centers in comparison to screenprint. This fluidity may be the closest thing screenprint has to a distinctive identity, which makes it either the most boring or the most interesting medium on the planet. 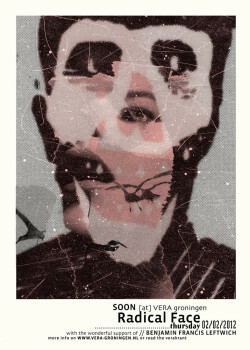 Andy MacDougall is a Vancouver Island–based printer, author and proselytizer for screenprint. He is fascinated by the idea that “the same process that lets an artist make multiples of their work with a squeegee, a stencil and mesh on a frame also makes the control interfaces and electronic guts of most of our digital consumer products.”7 His website, Squeegeeville, offers resources for artists, designers and manufacturers. When asked to name his most rewarding adventures with screenprint, MacDougall mentions the American Poster Institute (which organizes the Flatstock rock poster shows); the Lengwiler book, which he helped bring to fruition; and One Tribe Design and Screenprinting, an organization of local First Nations (aboriginal) youth with whom he works. The range of activities is telling—even among people who care passionately about technique, screenprint can be as much a social device as a visual one. The medium’s “simple-mindedness” makes it a convenient entry point for students and amateurs. (Experts acknowledge that it is very easy to do but extremely difficult to do well.) The mechanism is essentially self-explanatory. Since you print through the template there is no left-right reversal between the template and the print, and the act of printing occupies a few seconds. “Cost effective, easy, and rewarding,” is how artist and professor Jeffrey Dell describes it.8 For those eager to begin photo-screenprinting, a kit with everything you need can be purchased in a strip mall for under $150. The more DIY-minded forego kits in favor of homemade exposure units and bathtub washout booths. In Minnesota, Screen Printing on the Cheap (SPOTC) has built a bicycle-trailer mobile press that can be pedaled around arts festivals, where anyone can be invited to pull prints, The imagery is often simple—SPOTC’s logo or a relevant message. For nighttime events they break out glow-in-the-dark ink. The goal of these activities, and of SPOTC’s eponymous book, is to make printing accessible to everyone. Views from Rikrit Tiravanija’s “FEAR EATS THE SOUL” at Gavin Brown’s Enterprise, New York (5 March–23 April 2011). This easy adaptability has also made screenprinting a common tool for nonprofits and community groups advocating self-expression and cultural awareness; some work out of basements and garages while others, like Taller Arte del Nuevo Amanecer (TANA), operate state-of-the-art facilities. 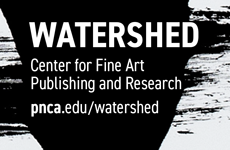 Connected to the department of Chicana/o Studies at the University of California, Davis, TANA offers workshops for preteens through adults, as well as a gallery. Other organizations employ screenprinting as a tool of social and economic mobility as well as religion. John 3:16 Screen Printing Ministry describes itself as a “Spiritual Boot Camp for Men with Addictions” that teaches a marketable skill to people who are often dismissed by potential employers. Houston-based Generation One mixes Christian ministry with screenprinting in the city’s impoverished Third Ward, providing at-risk young men with a potential career path. Screenprinting is seen as not just adaptable but marketable. 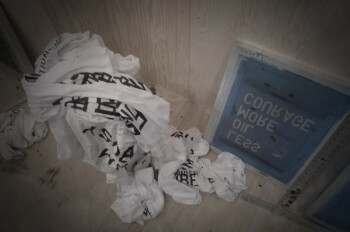 The portability of the equipment and its speed of printing made screenprint adaptable as a performance instrument. 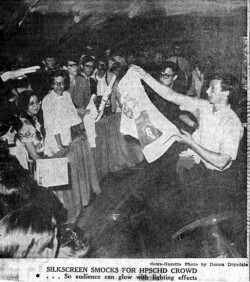 The premier of John Cage and Lejaren Hiller’s immersive multimedia extravaganza HPSCHD in 196910 included livescreenprinted posters (the designs were dictated by Cage’s chance operations, as were the prices), screenprinted paper tunics and, eventually, screenprinting on audience-member clothing. A 2013 recreation of HPSCHD featured live screenprinted T-shirts, though in a contemporary update the T-shirts were tied to the project’s Kickstarter Campaign.11 Live printing is now such a popular phenomenon the screenprinting firm Kayrock, which did the HPSCHD redux shirts, maintains eight mobile stations for live printing at parties and other events. Rirkrit Tiravanija’s 2011 exhibition “FEAR EATS THE SOUL” featured both a soup kitchen and a semi-custom T-shirt printing shop. by EMEK Studios, Inc., Portland, OR. Bottom: Mirjam Dijkema, Radical Face and Benjamin Francis Leftwich at Vera Groningen (2012), screenprint, 50 x 70 cm. Edition of 60. 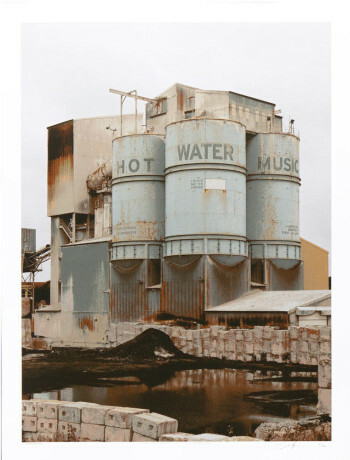 Printed and published by the artist, Groningen, Netherlands. The world of scruffy skateboarders (and their screenprinted decks) and indy rock bands (with their screenprinted posters) may seem the antithesis of the sleek commerciality courted by pop artists, but it is a feistily entrepreneurial place. Artist/designers (the terms are used pretty interchangeably) segue seamlessly from music posters to graphic design, illustration and advertising. The American Poster Institute defines its constituency as “the community of artists creating entertainment-related posters,” though many within this community also produce limited editions untethered to promotional tasks or commissions. The broader trend is toward images that are quirkily illustrative, transgressive in the manner of tattoo art and/or playfully decorative. Sixties psychedelia remains a powerful design precedent, as does, by extension, Art Nouveau, Surrealist juxtaposition and Victorian horror vacui. The well-known poster artist Emik acknowledges, “I can’t tolerate empty space. I have to fill it up with little details.”13 The focused, critical inquiries of contemporary art are largely beside the point for many of these designers, but there are myriad exceptions: Mirjam Dijkema in the Netherlands plays with replication and obfuscation in Hamiltonian ways; Daniel MacAdam makes bleakly beautiful records of our physical environment with words embedded in the self-effacing manner of 1970s conceptual art—Bernd and Hilla Becher go clubbing. 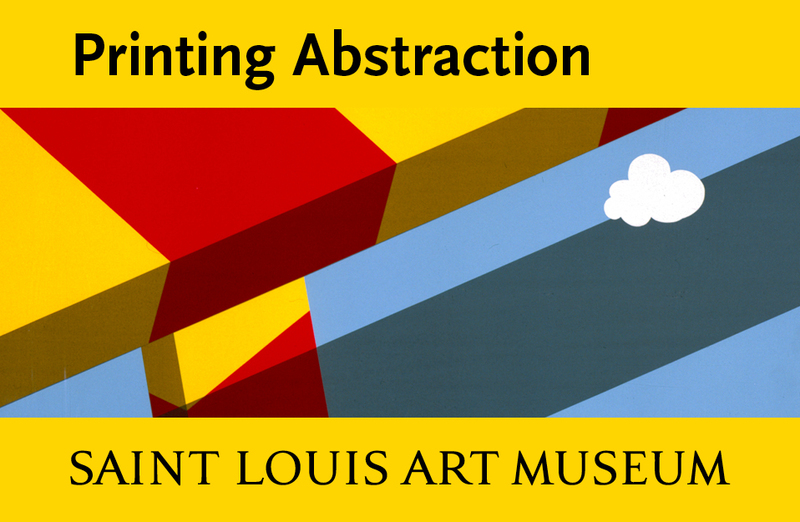 In this context, screenprint represents a handcrafted alternative to digital and photo-offset printing—an image-bearing object with greater tactile and material distinction, bearing solid swathes of ink. This is not a Luddite movement: designs are worked up with the help of Apple and Adobe, and the printing is often intricate, ambitious and adventurous. Technical skills are high, and collectors are keen and obsessive. ExpressoBeans.com, a volunteer-run site that collates data on collectibles from screenprinted posters to skateboard decks, even offers scattergrams of price histories (edition sizes and resale prices both tend to settle in the low three figures). 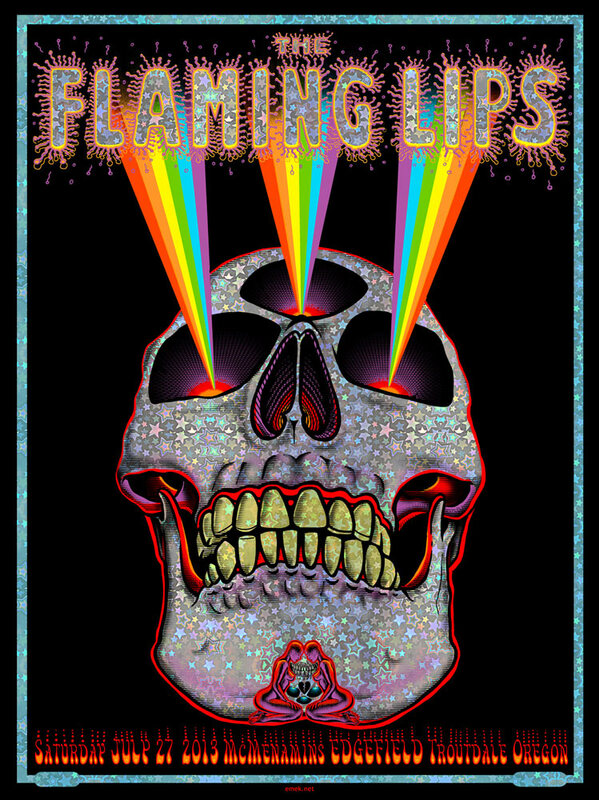 Gigposters.com lists 11,409 designers, 134,170 bands and 153,680 posters. Among this audience, screenprint-qua-screenprint is recognized and broadly discussed. In the “serious” art world of white wall galleries, however, screenprint passes by largely unremarked, even as it has infiltrated nearly every aspect of contemporary art production. 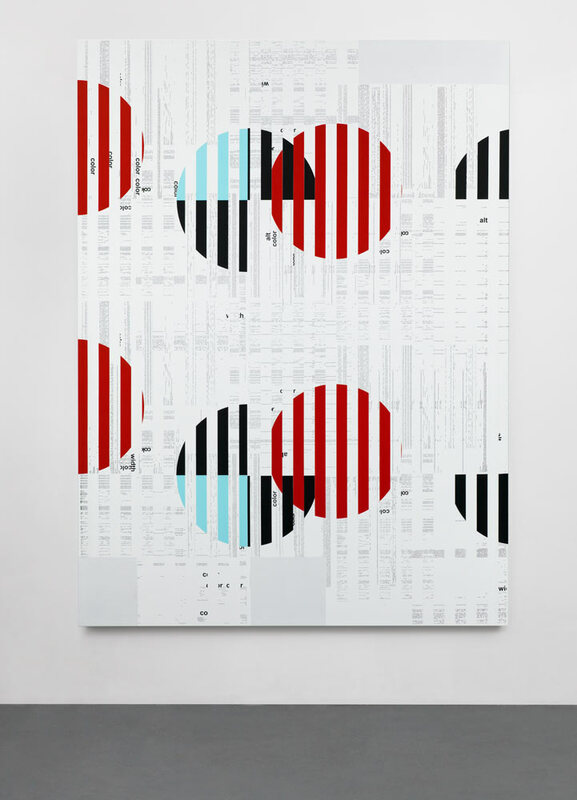 Kelley Walker, Bug_156S (2013-2014), four-color process screenprint on aluminum, 5.1 x 19.1 x 69.9 cm. ©Kelley Walker. Courtesy Paula Cooper Gallery, New York. Photo: Steven Probert. Screenprinter Luther Davis, who worked on the Walker project, points to screenprint’s singularly compliant nature: you can pretty much print on anything. And because of screenprint’s relevance to industry, serious capital is directed to the development of new inks, surfaces and applications, making new options available to artists all the time. 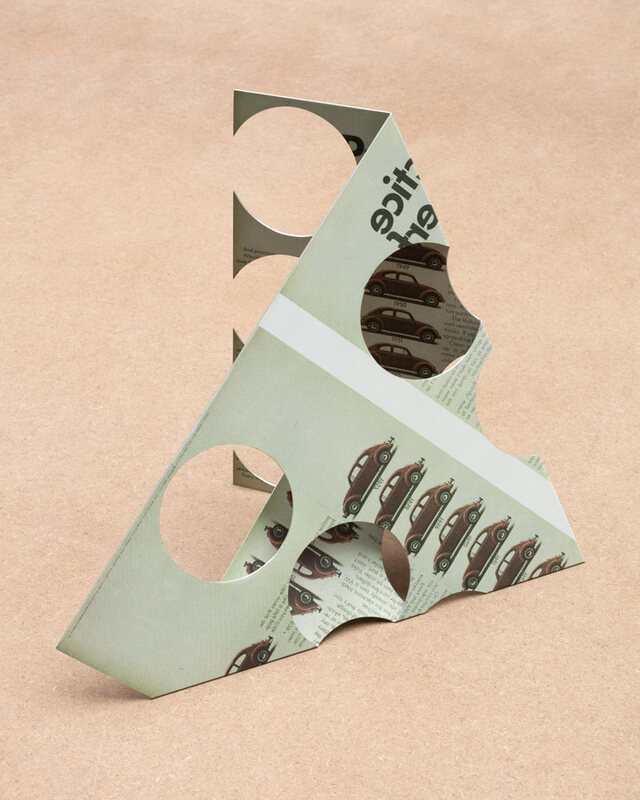 Beuys made multiples from screenprinted blocks of wood, slabs of felt, shopping bags and cardboard; John Baldessari’s new project for The Thing Quarterly consists of a pair of screenprinted cotton pillowcases “made to be used,” bearing the image of a woman hugging a pillow. In his Bullies wallpaper (1992–97) Virgil Marti arranged the yearbook faces of his middle-school classmates amid a psychotic floral pattern, screenprinted in fluorescent inks on Tyvek housewrap. Hank Willis Thomas’s And I Can’t Run and Blow the Man Down (2013) (reviewed in this issue) exploit the reflective surfaces used for road signs to make a visceral point about the inconsistent visibility of the past. 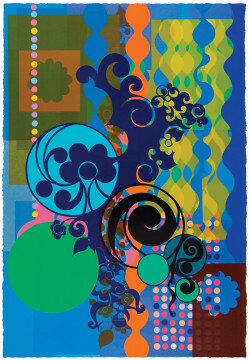 Beyond the bells and whistles of opalescence, reflectivity and edibility, screenprint is revered by artists and printers for the thing it has excelled at from the start: “for sheer force of color,” Davis says, “there is nothing better.” Opaque colors can be mixed to any hue and applied in solid blocks without the dilution of CMYK approximations.16 By layering transparent inks, a world of unexpectedly subtle color can be unfurled: 12 transparent colors overlaid can yield more than 4,000 combinations; with 20, the potential outcomes number over a million. Top: Janet Fish, Cerises (1992), 12-color screenprint, image 28 x 24 inches, sheet 34 x 28 1/2 inches. Edition of 60. Printed and published by Stewart & Stewart, Bloomfield Hills, MI. Photo ©StewartStewart.com 1992. Bottom: Beatriz Milhazes, Figo (Fig) (2007), woodblock and screenprint, 70 x 47 inches. Edition of 30. Printed and published by Durham Press, Durham, PA. Courtesy of the artist and Durham Press. Jasper Johns’ works with Simca Print Artists in the late 1970s and early ’80s were a revelation.17 They didn’t look like advertising, they looked like slightly stiffened gouache paintings, an effect achieved by the artist redrawing his own marks to produce multiple layers that “confuse the flatness.” Doubling and layering are recurrent Johnsian strategies for exploring sameness and difference, distinction and identity; they can also build a complex visual and cognitive device from a simple-minded stencil. Janet Fish’s screenprints of the 1990s were also constructed layer by layer. She would paint an initial image in black on transparent Mylar, which (via a photographic positive) generated the first screen. A color proof would be pulled, over which the artist would lay another sheet of Mylar, adding the strokes to be printed in the second color, and so on. 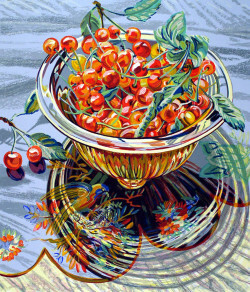 The process is similar to how she might work on a watercolor, but segmented, and the result is to sharpen further the lapidary edge on which her chromatically dense tablescapes and crockery depend. This force of color is also why screenprint is so often used in combination with other print technologies, as in Jennifer Bartlett’s At Sea Japan (1980; woodcut and screenprint) or Beatriz Milharez’s Figo (Fig) (2007; woodblock, screenprint). At Thomas Dane gallery in London this past winter, Glenn Ligon showed three monumental paintings reprising Steve Reich’s 1966 tape-music composition Come Out. Reich’s work used the words of a youth falsely accused of murder in conjunction with the Harlem riots of 1964, overlaying multiple identical loops of the recorded statement and allowing them to slip out of phase with one another until the words become unintelligible. Ligon worked the same trick visually, compiling blocks of the phrase “come out to show them” in stammering repetition until clarity and meaning is overcome by noise, contradiction and the sepulchral beauty of black ink screenprinted again and again over each painting’s 20-foot span. The “PowerPoint” paintings Michael Riedel showed at David Zwirner last year were screenprints on stretched linen that reproduced his own earlier works— photographed, inserted as slides in a PowerPoint presentation, then captured midway through a crossfade between one slide and another. 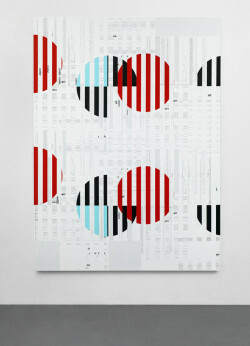 Michael Riedel, Untitled (Comb Vertical) (2013), screenprint on linen, 229.9 x 170.2 cm. Courtesy David Zwirner, New York/London. When Rauschenberg and Warhol first began screenprinting paintings in 1962 the use of screens (and the mass-produced images on them) was a radical gesture. Both artists wielded those screens as personally as they had brushes, and when Warhol moved to his Factory model, that move was itself a specific carrier of content. For artists a half-century later, the decision to have work executed by professional screenprinters is simply a pragmatic way to produce desired objects, images and surfaces. Walker, Ligon and Riedel are interested in the cultural and psychological effects of replication, reiteration and recapitulation—merging the seamless surfaces of industrial production with the cultural authority of painting is a means of getting inside those workings. Coldwell observes that from a printmaking perspective, screenprint’s industrial associations help preclude the “kind of fetishisation that canoccur with etching and woodcut.”19 In the context of paintings that derive from, and comment on, the lovely and perfidious manipulation of visual information, screenprint may be part and parcel of fetishism itself. Four decades after the Field exhibition, the borders between commercial production, critical art content, funky artisanship and the social production of meaning are more indeterminate than ever, and screenprint—more than etching or video or paint—has become the medium of indeterminacy.